In terms of transport flows, Gauteng functions as a city-region with connectivity between all the municipalities. 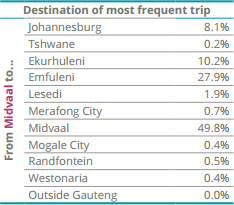 The transport linkages within each municipality are far stronger than those between the municipalities. Johannesburg is the transport hub of the city-region and has an important role in terms of providing access to jobs and services. 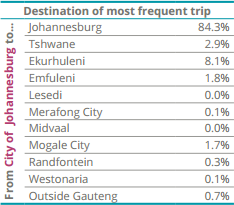 The movement patterns across Johannesburg and Ekurhuleni are entwined, highlighting the need for integrated Gauteng-wide planning of mobility networks and land use development. The historical apartheid-derived social and economic linkages between previous disadvantaged townships and their nearest urban centre are still evident. For example: Soshanguve/Mobopane and the Pretoria CBD; Soweto and the Johannesburg CBD; and Kathlehong/Vosloorus and Germiston. What are the key movements within and the functional linkages between various parts of the city-region? To answer these questions, the “most frequent” trip undertaken by each respondent in the GCRO 2011 QoL survey was mapped. The map visualises movement patterns by plotting desire lines. These are the direct routes (as the crow flies) from the origins of the trips to the final destinations.